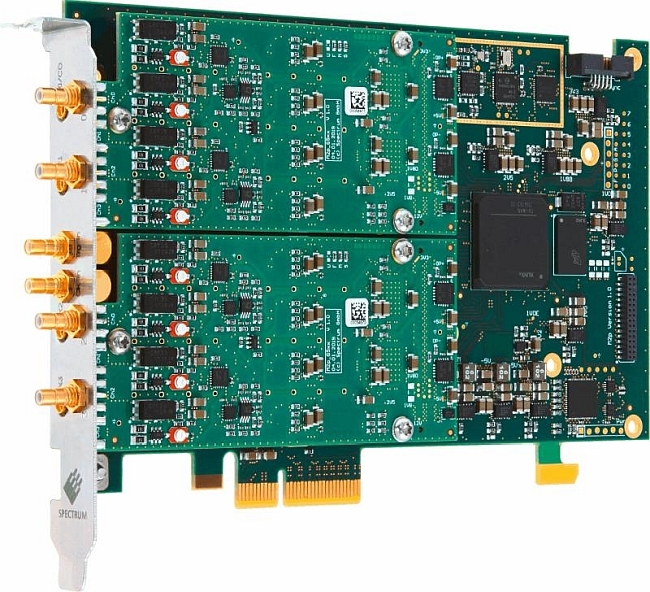 Spectrum Instrumentation announces the M2p.65xx series of PCIe format cards for the generation of arbitrary waveforms (AWG) at frequencies from 1 to 60 MHz. The M2p.65xx series includes six models with 16-bit resolution and a PCIe x4 interface for streaming speeds up to 700 MB/s. These AWG cards have a length of only 168 mm which adapts them to most PCs. Spectrum Instrumentation’s M2p.65xx series boards are equipped with one, two or four channels depending on the model. Two different output speeds can be configured: 40 or 125 MS/s. Each channel has its own digital-to-analog converter and its own output stage. Multi-channel cards share a common clock and trigger to ensure synchronization. The output stages incorporate four switchable filter paths to optimize signal quality. These boards offer the possibility of generating signals with variations up to ±6 V under load at high impedance (1 MOhm) or ±3 V at 50 Ohms. Each card has a memory of 512 Mpts. This memory can be segmented and waveforms can be created by looping on, and switching between, different segments. 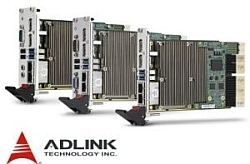 The AWG cards also have a FIFO streaming function that allows you to read new waveform data on the PCIe bus (at speeds up to 700 MB/s) while reading information already transmitted. This allows you to create long waveforms, single waveforms or continuously varying burst signals. 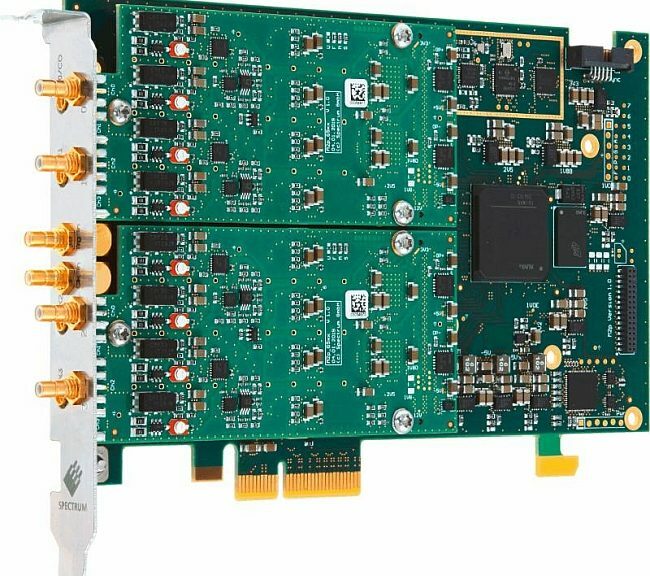 For applications that require the connection of AWG cards and scanning, Spectrum’s Star-Hub module synchronizes up to 16 separate cards from its M2p range. The Star-Hub distributes a common clock and trigger signal to each channel, ensuring synchronous operation. It is also suitable for applications where several test points, or sensor networks, must be stimulated by different test signals at the same time. The M2p.65xx series cards are programmable and drivers are provided free of charge to support the most commonly used languages (such as C++, VB.NET, C#, J#, Delphi, Java or Python) as well as third-party software tools such as LabVIEW and MATLAB. It is also possible to use SBench 6 Professional, Spectrum’s software,. SBench 6 allows you to control all modes and settings of the AWG boards. The software is designed to support multi-channel operation and has waveform display, signal generation, data analysis and documentation functions. Basic signals can be created using the software’s EasyGenerator function as well as more complex signals from mathematical equations or imported from other programs or devices (such as scanners or oscilloscopes) via binary, ASCII or Wave formats. The board signal outputs as well as the clock and trigger inputs are available via SMB connectors on the front panel and four MMCX connectors (one multifunction output and three multifunction I/O lines). Switching the multi-function I/O lines to the digital output adds four additional synchronous output channels to the arbitrary generation board. A single card then combines four analog outputs and four digital outputs that can operate in parallel at full speed.